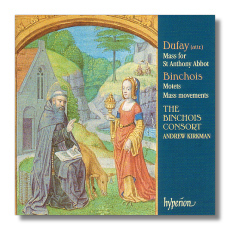 This disc performed by the Binchois Consort conducted by Andrew Kirkman brings together Guillaime Dufay's attributed Mass for St. Anthony Abbot and Binchois' 3 Mass movements and two motets. Dufay's Mass is the second of the composer's 'Anthony Masses' and is thought to be the long-lost and long-sought after work known to have been bequeathed to the great Cambrai Cathedral, Dufay's spiritual home no matter to what country his international career took him. Although doubts remain as to whether this mass is really by Dufay, its music is so unmistakeably divine, listening with the hope of spotting traces of the composer is pleasure indeed, but at the end of the day it is the sustained musical fascination, the flow and translucency of texture and the original inventiveness of line and rhythm that will arrest the listener and transport him into this ethereal sound world of absolute purity. The 3 motets, 'Domitor Hectous' and 'Nove cantum melodie' plus the 3 Mass Movements by Gilles Binchois make up the remainder of this disc. The 3 Mass Movements are wonderful examples of restrained but meaningful Church music. Although written in an essentially lyrical idiom whilst also being notably concise, they display a strong sense of musical shape as well as a predilection for harmonic twists and glimpses of melodic daring. 'Nove cantum melodie' is full of happy and brilliant music. And so it should. It was written for the baptism of a new male heir to the duchy of Burgundy in January 1431. Its festive radiance is indeed infectious. 'Domine Hectoris' is a poem dealing with the concepts of the Cross and Holy Lance. Binchois' music compliments the text in its exquisite and refined sense of expressive tact and richness. The Binchois Consort interprets this music immaculately, oozing out every hidden jewel to delight the senses. The annotations (they also include profuse information on St. Anthony Abbot) by Philip Weller are absolutely riveting and this just adds added allure to make the whole one of my discs of the year.